The two ingredients critical to the continued success of our instrumental music programs are funds and volunteers. IMPA needs active volunteers to keep our program strong. Please complete the participation form using the button on this page so we can keep you and your student(s) informed about opportunities and events. Or download our printable form and bring it to the IMPA table during student registration in August. Donate any amount, to contribute to any of IMPA's programs. IMPA has no paid personnel, so your donations benefit programs, not administrators. Tip: In addition to a one-time donation, you can also sign up for an automatic monthly contribution. Please consider contributing to the BHS Instrument Fund. Our programs depend largely on the generosity of the community to purchase new instruments and maintain our current collection of instruments. Thank you for making it possible to put quality instruments into the hands of our student musicians. Make your donation to the Instrument Fund today! We provide opportunities for students to earn money through fundraisers and helping at school events. These funds are deposited in each student’s individual IMPA-managed account, and can be used for music lessons, school trips, instrument purchase and repair, concerts, and other music-related activities. We encourage all instrumental music students and parents to participate in one or more of these activities. Students can earn $25 per event working at instrumental music concerts in which they are not performing in at BHS. 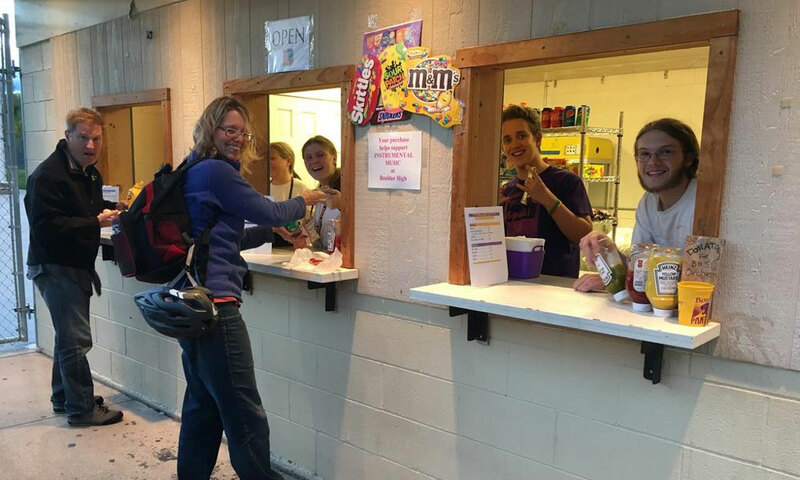 Students can earn $50 per game helping run the concessions booth at some Boulder High games. Go to HelpatSchool to find out about upcoming IMPA-sponsored events and sign up to volunteer. You and your families and friends can use reloadable grocery cards from local food markets. Each card costs $5 and comes loaded with $5. Every time you load new funds onto a card, that store gives 5-7 percent of the total card value to IMPA ($5-7 for every $100 spent), an easy way for any supporter to continually give to IMPA. You can also help us market grocery cards at school events (and to your friends and family members, if you’re so inspired!). Help your student by buying wreaths and plants during the annual fundraiser (October-November) and helping your student market them to friends, neighbors, and family members to raise money for their Student Music Accounts. All music students are encouraged to take advantage of this opportunity to earn money for their student accounts by participating in IMPA's annual Wreath and Plant Sale (October-November). Every year, BHS students can sell plants and wreaths to raise money for student accounts. The wreaths are produced in Colorado and sold to IMPA by the Future Business Leaders of America (FBLA) student group at Boulder High School. The plants are provided by a company called FUN Services in Denver. 2018 sale details: Students sell plants and wreaths between October 10 and Thursday, November 1, 2018. Students must turn in their order forms and checks to the box in the Main Office (keeping the yellow copy or a photocopy of each order form) by 3:45pm on the 1st of November. All Plants and wreaths will available for students to pick up at Boulder High on Tuesday, November 27 (the Tuesday after Thanksgiving), from 2:30-5:30pm, in the Band Room and/or just outside it. Students are responsible for delivering the plants/wreaths to their buyers and must make arrangements to pick everything up at Boulder High on November 27th. Note: if you download the PDF, be sure to keep a copy of each order form before you turn in your original order form with the checks for each order by November 1. This way you will have the information about where to deliver your plants and wreaths. The BHS-IMPA scholarship program supplements BHS student music resources to ensure that all students have fair and equal opportunity to participate in private music lessons, trips, and other music activities. IMPA’s modest scholarship program can defray some costs for students with limited resources. Because IMPA also provides many student fundraising opportunities, we consider student participation in fundraising activities when we review scholarship applications. For details, and to apply for a scholarship, download the BHS-IMPA Scholarship Application.